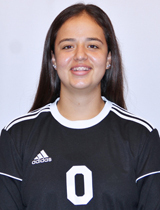 Reyna Gonzalez, a Liberal native, was a big part of Barton’s success last week earning two of the three wins in net, turning back sixteen shots for a .941 save percentage. Collecting three saves in the first half against Garden City, Gonzalez nearly single handily protected a 1-0 lead until the Barton offense got rolling in a road upset win at 15th ranked Cloud County. Rejecting a career high tying thirteen saves, coincidentally occurring in last season’s game at Cloud County, Gonzalez thwarted nine attempts in first half action with most coming on big time net protections. From full laid out horizontal stops, close range rejections, scrambling to turn away rebounded shots, and winning the battle of 1v1, Gonzalez kept the net clean until surrendering a lone second half goal coming on a redirected header from a free kick.